Former Republican Sen. John W. Warner, never bashful about defying the Virginia GOP establishment, endorsed his Democratic successor's re-election bid Monday. Warner told The Associated Press in a telephone interview that he is supporting Sen. Mark R. Warner, who is being challenged by former Republican National Committee chairman Ed Gillespie in November's election. The Warners are not related. "There are times you must, I think, recognize that certain individuals are superior in their talents and in what they have done and can potentially do for your state," John Warner said. The endorsement comes 20 years after John Warner riled the ascendant conservative wing of the state GOP by backing independent candidate J. Marshall Coleman instead of Iran-Contra figure Oliver L. North in the campaign against Democratic U.S. Sen. Chuck Robb. The year before, he had declined to endorse Republican home-schooling advocate Mike Farris for lieutenant governor. Peeved party loyalists backed former Reagan administration director Jim Miller against Warner in a primary in 1996, but the popular centrist incumbent survived and went on to a closer-than-expected general election victory over the Democrat he is now endorsing. This is the first time John Warner has publicly backed a Virginia Democrat, although he has also recently donated to the campaign of Democratic U.S. Senate candidate Michelle Nunn in Georgia. He praised his successor for following in his own tradition of seeking bipartisan solutions. "Mark Warner, if I may say with a sense of humility, like John Warner crosses the aisle and makes things work," he said. "We come from the old school. The Senate works best when there's collaborative effort between the two parties." Eighteen years after handing out "Mark Not John" bumper stickers to all who would take them, the senator said he is grateful for the support of a former opponent who later became a close friend. "John Warner is the gold standard in Virginia," he said. "I learned a lot of things from John Warner, but the most important is Virginia always comes first." Gillespie took the high road in a written statement. "I respect Senator John Warner for his service to our country and our commonwealth, and respect his right to support the candidate of his choice in this race," he said. University of Virginia political analyst Larry Sabato said the endorsement should give Mark Warner a boost among middle-of-the-road voters who have been abandoned the GOP. In last November's elections, Virginians rejected an extremely conservative Republican slate and gave Democrats their first sweep of the top three state offices in 24 years. "The premier effect will be a television ad that will underline Mark Warner's broad appeal, at least to moderate Republicans. How many of those are left, I can't tell you," Sabato said. "The Republicans have lost not only moderates, but also a lot of moderate conservatives." 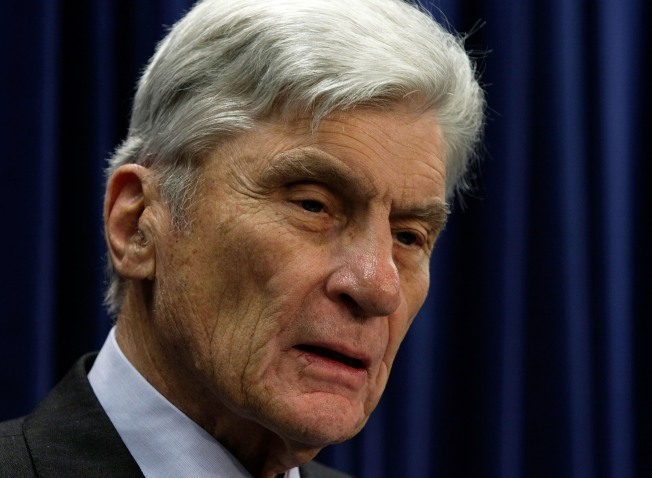 There has been no discussion of how actively the 86-year-old retired senator will work for the campaign, John Warner said. Mark Warner, a multi-millionaire cellphone pioneer who had served as state Democratic Party chairman and helped run L. Douglas Wilder's campaign to become the nation's first black elected governor, lost by only 5 percentage points to John Warner in his first Senate bid. The surprisingly close race established him as a rising Democratic star in a then-reliably Republican state. He was elected governor in 2001, then soundly defeated former Republican Gov. Jim Gilmore for the retiring senator's seat in 2008. Gillespie chaired the Republican National Committee from 2003 to 2005. He also served as counselor to President George W. Bush and as an adviser to Mitt Romney's 2012 presidential campaign. He faces a little-known candidate, Shak Hill, for the GOP Senate nomination. "If he receives the nomination, Ed brings a lot of experience _ but it's a different kind of experience," John Warner said. "I respect him _ he's a fine person _ so nothing negative about him at all. It will be a good, strong, two-fisted, competitive race."